Many people lost loved ones in Scientology and Dianetics, either through disconnection, removal or offloading. Scientology is not that big, and many people leave, therefore I think that people who left recently can give information on missing persons. I have also added a few names in which I have a personal curiosity, because I want to know what has happened to them. Last seen by Jim Cook in January 1978, the month Jim was expelled of the SF org. There were assigned to be successors of Hubbard, but were removed by Miscavige. Rumors are that Pat lives on the streets, and that Annie is assigned to the RPF until hell freezes over. is searched by her dad, Brian Charlton. He escaped the RPF in 1979 and left her and her mother (Linda Holling) behind. is searched by Brian L. McCarthy. John is from Oak Lawn, Illinois. Brian and John went to high school and college together, and Brian doesn't think that John knows about the high school reunion this year (1997). He was supposed to be working for a branch of Scientology called "Flag Management" in the Hollywood, California office. Brian went to this building a year ago but John wasn't there, or wasn't available; Brian doesn't remember which. Brian also lives in Los Angeles and would like to renew his friendship with John. They were working for scientology about 1957 in Australia, left for the US, last heard of headed for Canada, no word since. is the son of David Cook and Vickki Ford. 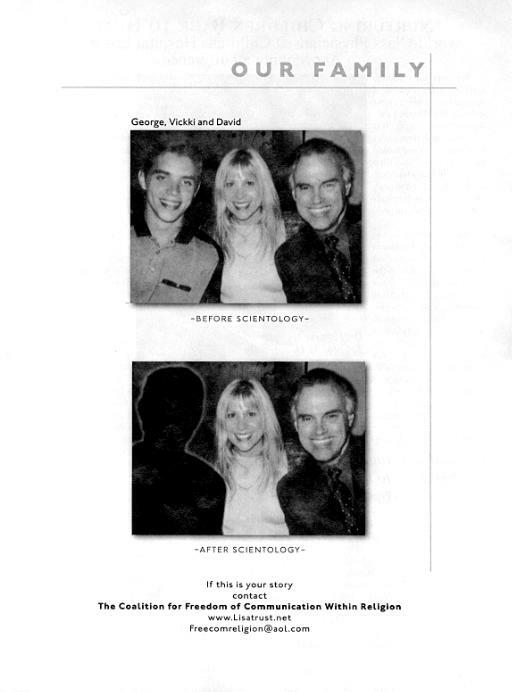 When both were declared "Suppressive Persons" in October 2001, George "disconnected" from his parents. He has been missing ever since. In April 2002, David and Vickki published this ad in US News & World Report. is sought by his friend Tarla Star (a nickname). He joined in '75 and is possibly still in the sea org. is sought by a former member of London Org staff from the 1970's who would like to remain anonymous. Ron Hopkins was CO Ldn Fnd for part of that time. Barry Wild was also at the London Org at that time and ran a company known as West One Decorators. Contact warrior at xenu.ca. Update: Warrior says that Ron has been located, but now the email address for the individual who requested the favor is bouncing. Please provide a current email address so Warrior can put you in touch with Ron, or kindly let me know if the favor is no longer needed. is looking for friends from Ashton-Tate (Feb 81-Jun 82), Sterling Mgmt Services (Oct 86-Apr 87), and the St. Louis Org (1973-1976). is sought by an old friend of him. Jeff was, and may still be, a member of Scientology. He was born in 1969 right around Thanksgiving and went to Berkeley High School for 9th and 10th grades. He went possibly to Apple School (TH: a Scientologist school) prior to 9th grade. In the summer of 1986, he went to LA to visit his father, a member of the church, and didn't come back. He was living in the church's compound for a time. Annie wrote the definitive account of life on RPF. Bonnie Woods, who now resides in England, is looking for her. born 17 July 1972, last seen at Golden Era Studios, is sought by his parents, Andre Tabayoyon and Mary Tabayoyon. A year or so after they left, his parents received a disconnection letter. He later wrote a few more letters that were harsh and cold directed to his mother to stop trying to contact him. His parents cannot believe that their son would not ever want to see or talk to them again, and they believe that he has been murdered or is being held incommunicado. According to former member Chuck Beatty, Casavius Tabayoyon has been adopted by Dan Przybylski, and changed his name to Michael Przybylski.